The show we worked on for the BBC Bang Goes The Theory, the 'Human Power Station' is featured in this months Focus magazine. 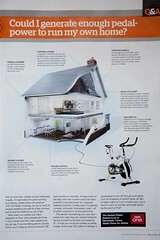 The article asks 'Could I generate enough pedal-power to run my own home?'. It's a great question that took months of our time in research, design and testing to work out! Eventually, we figured that the average home would require about and average of 4KwH each day with peak power at around 12Kw i.e. if someone put the kettle on while someone else was in the shower! So we built 80 bicycle generators to handle the peak load! It was an amazing experience for us and we hope you enjoy it too. Anyway, look out for the show on the 6th December on BBC1.